Time now to look at those toiling in the independents of professional wrestling. So I've decided to start with AAPW champion Edmund "Livewire" McGuire. I've known Ed for a couple of years now, meeting him first on MySpace (remember that?) and then eventually working with him on AAPW Collision. 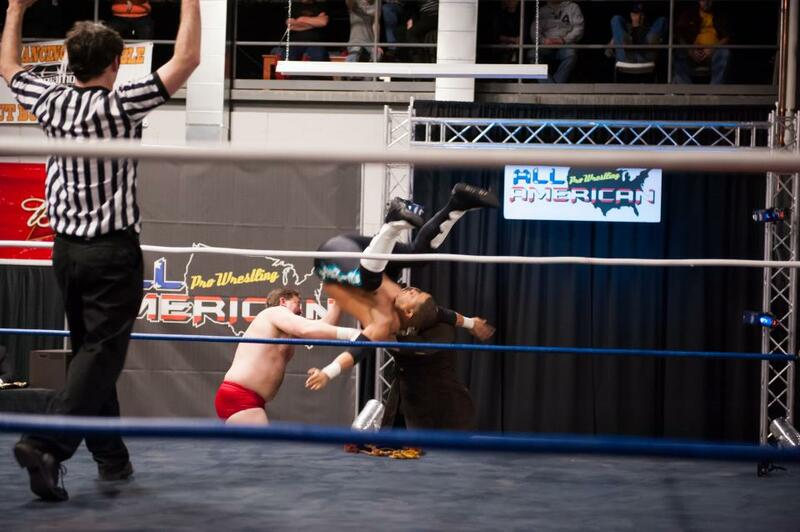 Livewire has been the AAPW champion three different times. He currently holds the title after a rough season facing the challenge of the brutal Ax Allwardt. Ed persevered in the feud and will start season two of Collision with the championship. Inside the ring, Ed is a hard worker. The fans love him and he has a never give up kind of attitude. Based on his performance at Main Event, he's not afraid to take risks either. 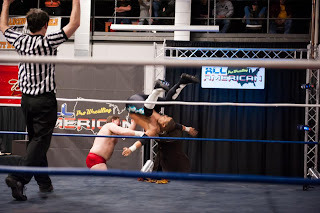 Ed went airborne to take out Ax and his manager, Gaylord Stevens all in an effort to defend his title. He's a real person, and I think the fans find that refreshing in a wrestler. Backstage, Ed is a great guy too. I've had a chance to talk with him outside the walls of the AAPW Arena (aka Black Diamond Harley Davidson) and learn a thing or two about him. He's dedicated to the business and making himself and everyone he works with better in the process. Ed has quite the following too. And he takes time before, during, and after each show to shake the hands of his fans. He poses for pictures and signs a lot of autographs too. On another personal note, which I guess most of this post is at this point, Ed really helped me out as I prepared for my in ring debut. The work we did in the ring helped me get ready for what was the experience of a lifetime. I worked with him and Heath Hatton on running the ropes and taking bumps. Ed taught me how to do a chop (wooo!) as well. It's something that I will never forget and appreciate him taking the time to teach a guy like me a thing or two about his craft. If you live in the Collision viewing area, I highly recommend you checking out a live event. We begin taping season two on Saturday, March 17th. You can see your favorite AAPW stars in person and most likely have a chance to get an autograph or two. Very nice read! I love The Livewire!